I had such a good time with other Wedding Vendors at Willows Lodge yesterday for Weddings in Woodinville – a showcase of dedicated vendors where Bridal Parties are shuttled from venue to venue by Butler Valet. Couples sip, nibble treats and meet the hard working “behind the scenes” vendors that make the event look seamless. Here is my cozy station at Willows Lodge, where Jenn Wenman hosted a gracious event. I met so many Brides, Grooms and their supportive families and friends – and everyone seemed to be having such a great time! I really enjoyed getting to work with Eric from Hybrid Moon Video (hybridmoon.com) , Jennifer with Creative (inspired invites and paper creations), Tanya Stone with her romantic floral arrangements (Elements in Bloom) and Laura Marchbanks talented wedding photographer. Special thanks to Jen Taylor from Taylor’d Events who helped pull us all together for the day! 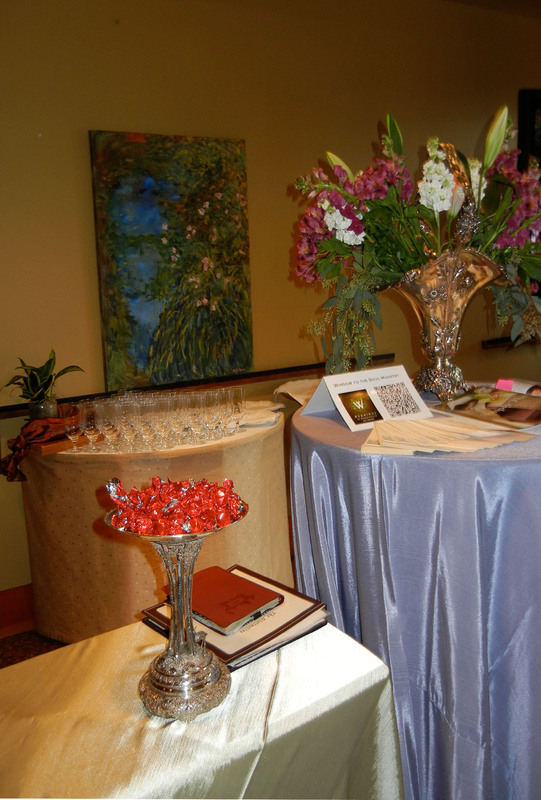 This entry was posted in Behind The Scenes and tagged Seattle Minister, Seattle Officiant, Seattle Wedding, Willows Lodge. Bookmark the permalink.